New client penetration has decreased more than 9% over the last 3 years. Acquiring new customers is getting increasingly difficult in a global service economy, which means deeper customer engagement and retention is critical. Employee attrition has risen by more than 6% to almost 13% from 2013 to 2016. Customer relationships become harder to maintain and the cost to business of replacement and training billable resource increases. Empowering your staff should be a key investment. Between 2015 and 2016, utilisation is down more than 5% on average and trending downwards. This primarily comes from a lack of agility and limited cross-functional visibility across the PSO. Fostering sales and project service team engagement is of the upmost importance. Project Service Automation is typically an end-to-end solution that provides project-based organisations with a single system of customer engagement for sales, resourcing, delivery and billing. A recent survey of project-based sales activities. Digital Transformation of Sales, Microsoft Survey Report by TOPO, July 2016 identified a 70% revenue increase by reducing sales cycles by 30%. Because the service delivery business is a high-ticket, resource-intensive business; incremental improvements in sales efficiency can drive exponential results. One way in which organisations can shorten or streamline the typical sales cycle is the use of customer collaboration portals. Customers can engage and collaborate with account managers real-time on the status and approval of quotes. They can review and update scope and resource requirements together, exchange private and public notes, and by working on the same platform allows complete visibility to both stakeholders. The customer can now check the status of the entire project lifecycle including invoices. In turn, this allows your sales team to focus on the value-add activities as opposed to administration. According to the “3 Amazing Facts You Didn’t Know About Time Tracking Software” study, it was found that on average $110k is lost each year for failing to accurately track time. By providing project teams and PMs with a consolidated view of personal appointment and project tasks on their normal exchange calendar in outlook and on their mobile device, organisations can make it easier to capture and improve time and expense management. The cornerstones of successful project service delivery are effective resource management, ability to plan projects and execution of collaboration. Project planning is key to mitigating project over-runs, according to the Project Management Institute in their “Project schedule and cost overruns” report they found that 72% are due to an incorrect estimation process. By equipping your practice and project management teams with familiar tools and full integration with their usual management tools (e.g. 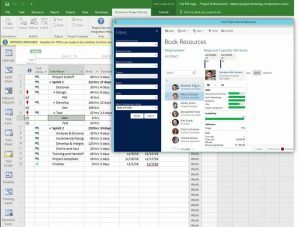 Microsoft Project), your staff can become more efficient and reduce any need to switch between applications in order to achieve holistic views of the project and its resource. In their 2014 report, Aberdeen Group found that there was a massive 122% improvement in on-time project delivery when organisations had an enterprise collaboration strategy in place. 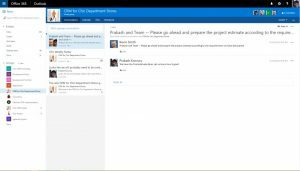 When PSOs can support such a strategy with familiar technology such as Microsoft Office 365 for Groups where project plans are automatically created and calendar entries show in team diaries relating to their project tasks; this makes collaboration work on a practical level for your staff. Because project deliverables are more readily available, risk is reduced to help management reach SLAs. Beyond collaboration within the project team, it is vital that your sales and marketing teams can work with the project office to estimate work to completion, produce accurate proposals both on a time and materials or fixed fee basis. 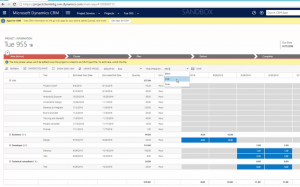 Dynamics 365 for Sales gives commercial teams with tools that fully integrate with and complement Dynamics 365 for Project Service Automation, to provide best practice for all areas and a smooth transition from estimate to project kick off. If a practice director has insights into project profitability, billable utilisation rates, sales cycles and cost over-runs then they have the ability to minimise risk, spot trends and ultimately grow their business. 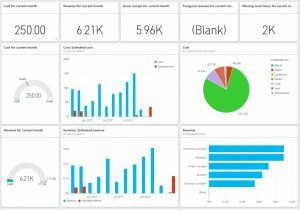 Dynamics 365 with built in PowerBI integration easily gives PSO management project-based dashboards to help them with new client penetration, employee productivity KPIs and profitable projects. 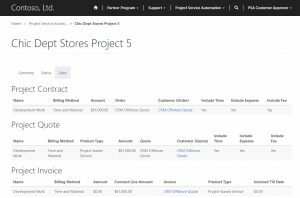 What is Dynamics 365 for Project Service Automation? Speak to Prodware about how Microsoft Dynamics can help professional service firms deliver outstanding experiences – consistently and profitably across every client interaction.